This conference, organised and managed by the Technical Textiles and Non-Woven Association (TTNA), will provide an overview of current developments in smart textiles, including products under development and those that have reached commercial markets. Wearables as well as smart textiles in sports, medical care and military applications will also be covered. FCST’s Dr. Floreana Coman is very well versed in Smart Textiles, and has driven a number of innovations in this field. As such FCST will be attending this event, as part of its on-going Research, Development and Innovation initiatives in this growing field. FCST is very pleased to announce that it has finalised agreements with the UMATEX Group to secure supply of high-quality carbon fiber tow for the ANZ market. For FCST this is an important step – to secure a reliable supply of high-quality input fiber for it’s weaving operation; and to be able to add carbon fiber tow to its wide range of product options. The UMATEX Group is Russia’s largest supply of carbon fiber materials and is now actively increasing its presence in the global market. After more than 40 years producing specialty aerospace grade carbon fibеr, UMATEX has now established its first large scale carbon fibеr production line for industrial grade carbon fibеr in the Republic of Tatarstan, Russia. With a capacity of more than 1,400 tpa of carbon fibеr, UMATEX products are competitive with other global suppliers – in both performance and price levels. Supporting its manufacturing operation, and with an eye to future growth, is an R&D Сenter, in Moscow. This well-resourced, state of the art facility is devoted to the continuous development and integration of technologies that will enable UMATEX to offer products to the demanding carbon fiber market. The 2017 ACI Conference and Exhibition was held at the Intercontinental Sanctuary Cove, in Queensland on Wednesday and Thursday, 29 – 30 March 2017, with a half-day technical workshop on Tuesday 28 March 2017. The 50 speakers from across industry, R&D organisations and academia reflected the conference theme “Shaping the future with composites” . They reported on current developments and innovations in materials, science, manufacturing processes and technologies across defence, aerospace, marine, automotive and mass transport, infrastructure and sport and recreation markets. Speakers and delegates came from across Australia and as far afield as China, Iran, Korea, Netherlands, Pakistan, Poland, Singapore, Switzerland, North America and the UK. As a result of the conference, the team at FCST are working on a number of projects initiated at the conference and in follow-up meetings with key industry participants. The Conference, organised and managed by Carbon Nexus and held in Geelong, comprised of two full days of conference(including networking and social events); plus an additional day enabling delegates and visitors to attend the Australian International Aerospace and Defence Exposition, in nearby Avalon Airport. Presented by Australia’s Technical Textiles and Nonwoven Association (TTNA), the 2016 Fire Resistant Textiles & Fibre Conference provided an open forum for the presentation of the latest science, technology, design and manufacture of fire resistant fibres, textiles, coatings and finishes for the protection of people, things and the environment. Testing, management and compliance of Fire Resistant characteristics of fibres and textile to reduce risk to the greatest extent possible was also explored. The Conference, presented and managed by the TTNA and sponsored by independent international textile certification organisation Testex, provided the opportunity to share latest knowledge and trends in this important textile field for society. Companies and organisations represented included textile manufacturers / suppliers; product manufacturers; safety equipment suppliers; dye and chemical formulation services; end-users; textile testing services; and composite materials suppliers. Dr. Floreana Coman, a long term and active member of the TTNA, was a member of the technical panel evaluating “peer reviewed” presentations prior to the conference. The Romanian Embassy in Canberra, represented by Ambassador of Romania Nineta Bărbulescu, hosted the second Romanian Scientific & Business Diaspora Symposium on August 1 -2, 2016. The Diaspora (defined as – a scattered population whose origin lies within a smaller geographic locale) Symposium provided an excellent forum for leaders in the Scientific and Business sectors, with Romanian connections / heritage to meet, network and generally share knowledge and experiences. In addition representatives of the governments of Australia, France, Germany and Iran were in attendance. A wide range of scientific and business topics were covered, with the highlight presentation on the next Australian multirole Ice Breaker & Scientific Research vessel for the Australian Antarctic Division, which will be built in Galați, Romania. FCST’s Managing Director, Dr. Floreana Coman, a notable member of the Romanian community in Australia, prepared a presentation, “Taking The Research From Lab To Market”, which was delivered by Ray Seddon. 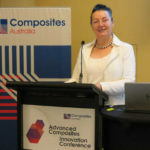 This annual conference, hosted by Composites Australia – with the support of SAMPE-Australia, the Engineers Australia technical society and the Australian Composite Structures Society (ACCS) – has proven to be a valuable forum for the sharing of industry and scientific knowledge on new and emerging developments in composites technologies, opportunities for new applications and markets as well as sessions to advance business management and marketing. The event was very well supported by the composites industry and attracted a number of guest presenters, who provided insights into a range of aspects of the industry. The conference dinner, held at the iconic Melbourne Cricket Ground, enabled delegates to “network” in a relaxed setting. 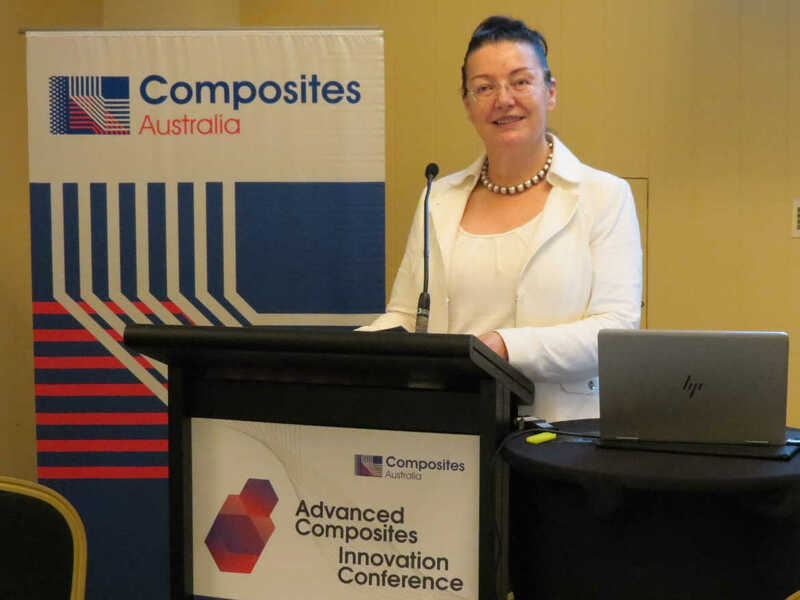 Dr. Floreana Coman, a long – standing member of Composites Australia – assisted in the review process for “Peer Reviewed Papers” and presented a paper highlighting possibilities made possible by smart textiles. WCSM-2016 was held at Singapore during March 4-6, 2016. Featuring more than 250 presentations and more than 50 exhibitors, the WCSM provided a platform for more than 300 professionals from around the world to exchange state-of-the-art research and development and identify research needs and opportunities in this emerging field. WCSM is the Asian Branch of WCAM (World Congress of Advanced Materials). Geelong (Victoria’s second largest city) is changing from a “rust belt” to a “black belt”. Carbon fibre composites are leading an industrial renaissance, and have been joined by other fibres, novel polymers and manufacturing processes. This SPE Event featured presentations from Deakin University’s Institute for Frontier Materials; the Australian Centre for Infrastructure Durability; Quickstep; Carbon Revolution and HeiQ Australia. A comprehensive tour of the Carbon Nexus production facility was included. FCST was represented at this event, which attracted more than 50 professionals from a range of plastics, composites and research organisations. We are pleased to advise that Ray Seddon joined the FCST team during January, and will assist with Business Development, Administration and Communication activities. Ray has worked in the composites industry for many years, most recently as the Network Manager of the Carbon Fibre Collaborative Network. Prior to that, he worked for Owens Corning, one of the leading global companies in the glass fibre industry, in a range of sales, marketing and leadership roles across the Asia Pacific region. The Asian Textiles Conference is held biannually by the Federation of Asian Professional Textile Associations (FAPTA). The 13th Asian Textiles Conference (ATC-13) was hosted by Australia’s Deakin University and Technical Textiles and Nonwovens Association (TTNA). More than 340 scientists, researchers and fibre and textile practitioners came from 17 countries to share the program of over 400 oral and poster presentations. During recent years Floreana has worked on a number of research projects at RMIT, which were supported by ARC Linkage Grants. Floreana continues to work in the field of wearable fabrics with “smart capabilities”. This is an exciting field, with considerable potential for commercialisation – in military / defence; medical and sporting industries.